Pete is the original Dial-A-Nerd. He created the Dial-A-Nerd concept in the late 1980's to provide telephone help to the general public. 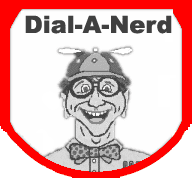 He first advertised Dial-A-Nerd in the 1990 USA Today classifieds. Dial-A-Nerd became the Dial-A-Nerd Radio show on WJFK Radio and then the Technically Correct TV Show on WMAR ABC Channel 2 in Baltimore . Pete has certainly been around since the earliest days of computers. He has personally met some of the pioneers of the Internet, but he has never met Al Gore. Pete often likes to claim he's older than the dust in a 1981 PC. Josh helped answering questions on the Dial A Nerd Radio Show. More seriously, Pete has written several books for Prentice-Hall Publishers: "A+ Certification and PC Repair Guide""The Telecommunications Survival Guide", and "SOHO Networking" and more recently "Pete The Nerd's Virus Removal for Everyday Users" available at Amazon.com. Since 1984 Pete has operated a SOHO LAN with various Windows, Linux and Novell Servers with large RAID drives. This network has supported Web Sites, an Intranet, WiFi and Gigabit Ethernet links, and connected to a PC that was the Television. Pete's network and PC support and troubleshooting experience comes from selling and supporting PCs and networks over the last 30 years. This web site was hosted on a Linux PC on Pete's SOHO LAN, but is now hosted by in the "Internet Cloud". Need help, click on play button then reply to send an Eyejot message to Pete now! To send a video reply, you need a webcam attached to your computer. Thanks! Get the Eyejot Video Mail widget and many other great free widgets at Widgetbox!